Another twofer coming your way, peeps! 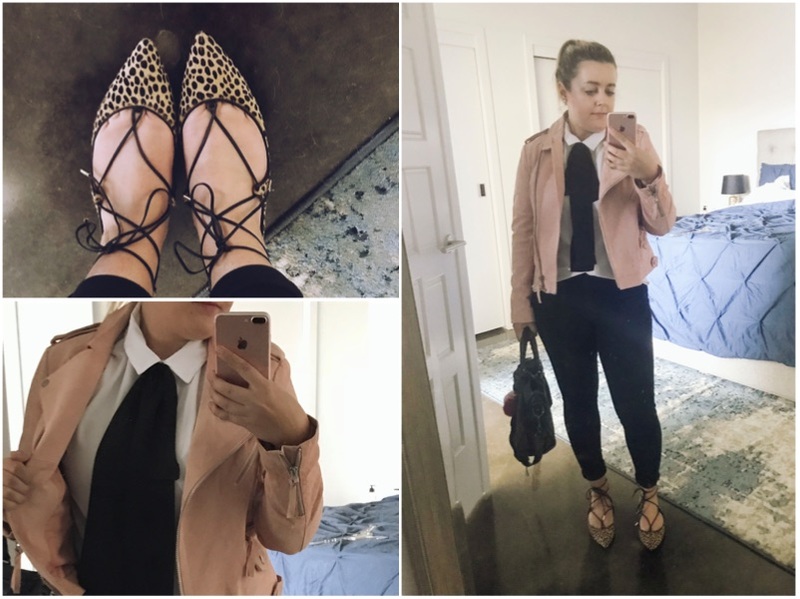 JustFab sent me this blazer to review and I could not resist the opportunity to show it two ways. That's because it is, in fact, a two-way blazer! One quick zip and it goes from a slouchy boyfriend blazer to a sleek short one. For a polished weekend look, I wore it long with jeans and flats. I absolutely love the color. I may have the sleeves shortened because I like a 3/4 length, but for now I just rolled them up. 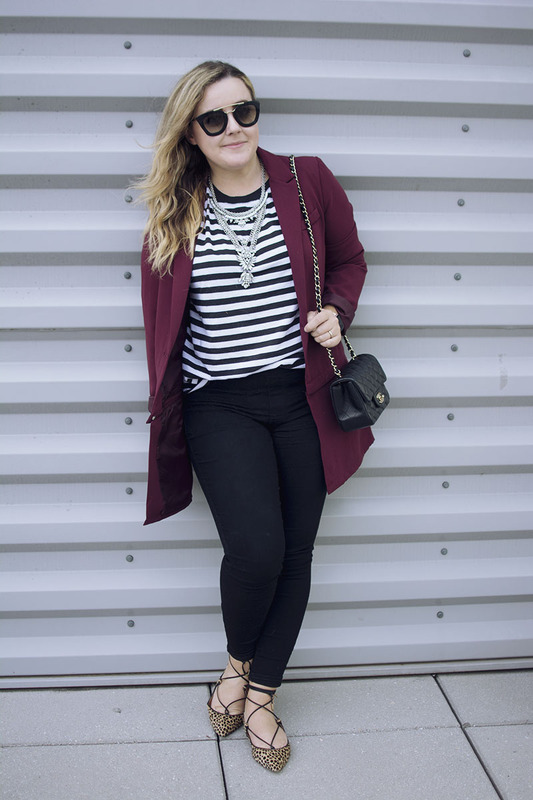 Blazer, c/o JustFab. Tee, H&M. Jeggings, Old Navy. Flats, Aquazzura via Poshmark (adorable similar from 6pm!). Necklace, BaubleBar. I had a presentation last week and I knew I wanted to wear this dress; it's long enough that I don't have to worry about flashing anyone, and the short sleeves are better for any pointing at the screen I was going to do (no one comes to work to see your armpits). So I threw this jacket on with it and realized the length was no good with the length of the dress. In my head, it worked, but in real life I looked kind of frumpy. No worries there, I just unzipped the bottom of the jacket and made it into a cute little blazer. Blazer, c/o JustFab. Dress, Treasure & Bond via Trunk Club (similar from SheIn). Bag, JustFab. Necklace, BaubleBar. Heels, Manolo Blahnik. October is the worst month in Arkansas. Things start LOOKING like fall, and you'll get an occasional crisp day that kind of feels fall-ish, but then a day later it's in the 80's again and you're just a tiny sweat factory. Humidity is the enemy of cuteness. 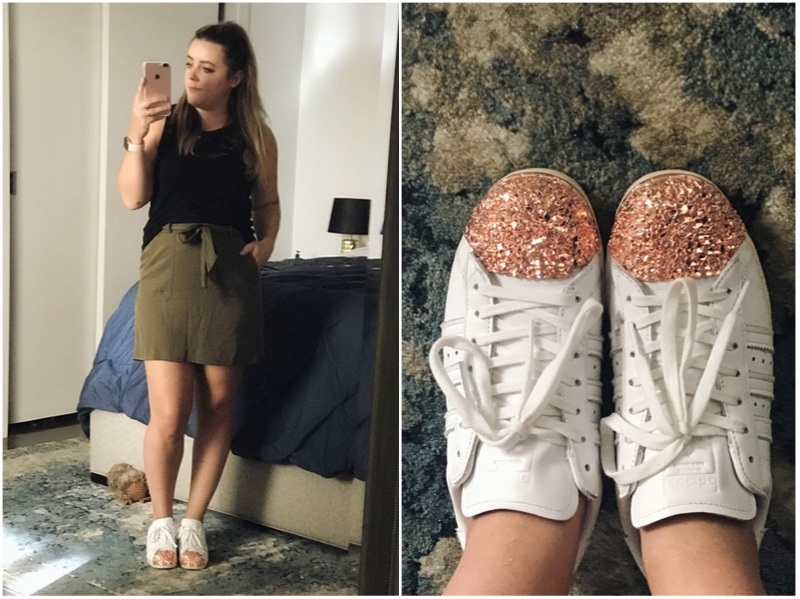 So this month's "Things I Wore" is fun because you'll see a progression of the weather! Disclosure: Some of these links make me money. Some don't, because I wanted to link the exact item for accuracy. I've provided similar options whenever something is old or sold out! Enjoy. First of the month stayed pretty solidly in the 80's during the day, 70's at night so there was no need for layers. I barely managed to get dressed these days. Outfit 1: Top, Everlane. Pants, Zara. Flats, Parfois (similar from Asos). Outfit 2: Tank, H&M. 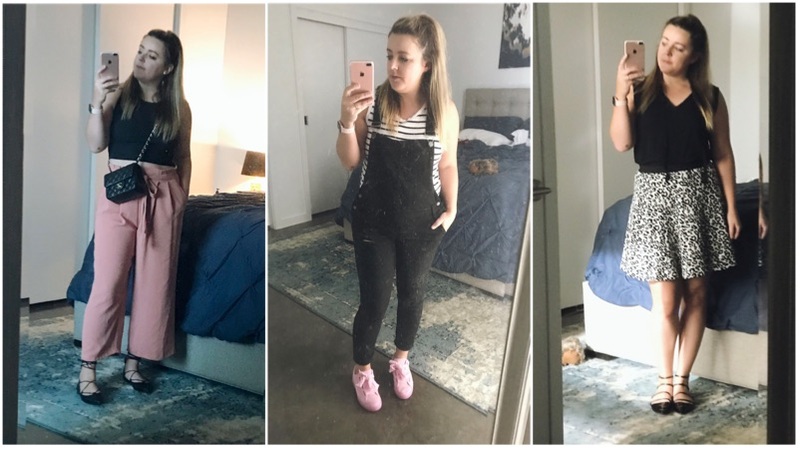 Overalls, Topshop (similar from Asos). Sneakers, Puma (you may have to search a bit for this color - but here's a VERY similar Puma from Free People!). Outfit 3: Top, Old Navy (similar from Rack). Skirt, Rebecca Taylor. Flats, Zara (similar from AE). I did try to dig around in my closet this month and get creative with items that had a more fall-like feel that I could still wear in the heat, so I rediscovered this cute olive skirt from the Loft I bought a few years ago! Skirt, Loft (similar from Rack). Tank, H&M. Sneakers, Adidas (similar in silver). 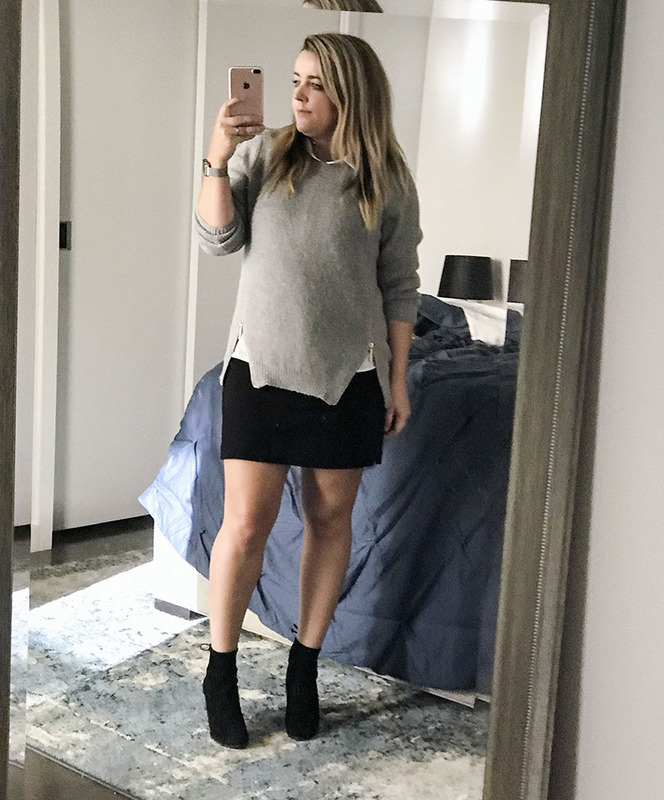 By this outfit, things were starting to get chillier in the mornings and evenings so I was able to snuggle up in this extremely cute and cozy cardigan, which later would be slung around my hips around lunch time when it was warm again. Cardigan, JustFab. Tank, Everlane. Skirt, Zara (similar). Boots, Stuart Weitzman (similar from Rack). Necklace, BaubleBar. 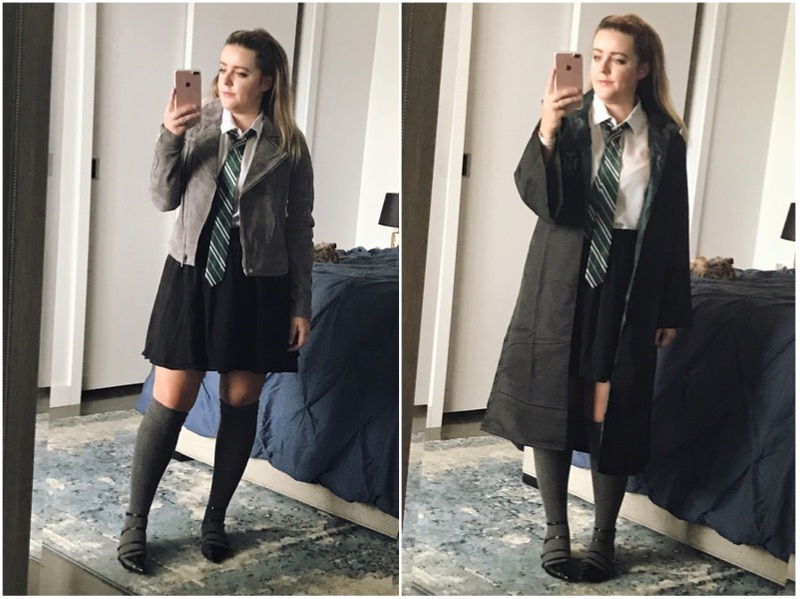 After work Halloween party in the alley gave me an excuse to get creative with my workwear this day, so I went for the school girl look and then slipped on my Slytherin cape after 5. VERY SUBTLE. Top, Elizabeth & Clarke. Skirt, JustFab. Suede Jacket, BlankNYC. Socks, Asos. Flats, Zara. Slytherin Cape & Tie, eBay. Love, love love this sweater and have been wearing it any chance I get - here's my winter uniform for work. Sweater, Elizabeth & Clark. Blouse, Elizabeth & Clark. Skirt, Belk (similar from QVC). Booties, Stuart Weitzman (basically identical from DSW). And finally, it was time to pull out the boots again. These demons are my favorite but I really need to put my calves on a diet so they'll go all the way up my leg like GIgi Hadid's. I walked outside in this get up and realized it was COLD, so I came back in and threw on a leather jacket and had to take another snap. Because being on time to work is overrated. Have I mentioned that Halloween is my favorite month? Because it is. You can get away with SO much weird stuff in October. I actually startled a woman who got on the elevator with these bad boys. She said, "You do you girl, you just made my day." These monstrosities were appropriate because we were seeing a live Rocky Horror Show production at The Weekend Theater after work and you gotta go all out for Dr. Frankenfurter. Jacket, Kenneth Cole. Tunic, Nordstrom (honestly would buy every color). Leggings, Spanx. Boots, ShoeDazzle. 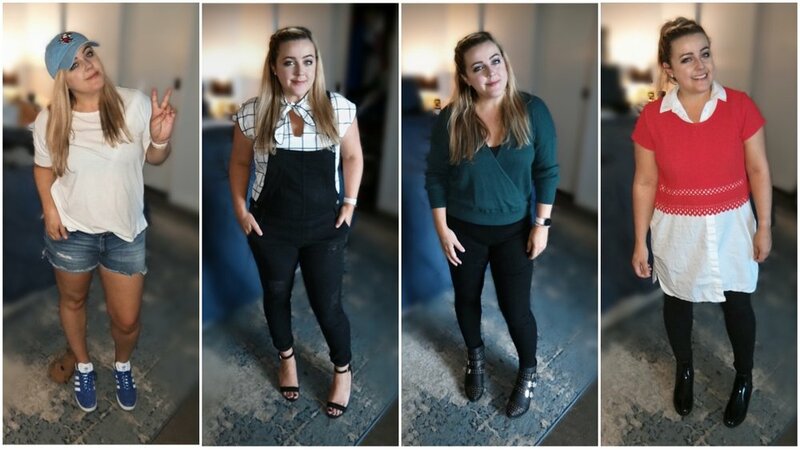 Here's some work wear for you from October. Layers is the name of the game when you walk to work, as is USB fan once you get to your desk. Outfit 1: Top, Zara. Skirt, Belk. Heels, Valentino. Yes, I kind of felt like a flight attendant. Outfit 2: Tunic, Nordstrom (same awesome one as before but in olive!). Trench, Everlane. Jeggings, Old Navy. Heels, Valentino. Outfit 3: Blouse, H&M. Vest, Banana Republic (similar). Leggings, Spanx. Boots, JustFab. Outfit 4: Cardigan, Halogen via Trunk Club. Tank, Lush via Trunk Club. Jeggings, Old Navy. Heels, Manolo Blahnik. Suede Jacket, Asos. Blouse, Elizabeth & Clarke. Tie, Asos (similar from F21). Jeggings, Old Navy. Flats, Aquazzura via Poshmark. Bag, Balenciaga via Poshmark. Another classic work to weekend fall look, brought to you by the exact same pieces you've seen a thousand times but probably haven't even noticed. Suede jacket, BlankNYC. Tee, H&M. Jeggings, Old Navy. Necklace, BaubleBar. Heels, Manolo Blahnik. AND FINALLY...no October wear post would be complete without my Halloween costume? I've been spending basically all of my free time exploring in The Legend of Zelda: Breath of the Wild on my Switch so I knew within ten seconds of playing that game what I was going to be for Halloween (here's what I am for the non-nerds in the room). That wig...was spectacular. I choose all of my costumes around wigs. Costume: Handmade by me. Leggings, Spanx. Boots, Asos (similar from DSW). Wig, Amazon.